Chop the pork belly into bite sized pieces. Finely chop the lemongrass, shallots and garlic. Add honey, salt, seasoning and teriyaki, mix well and rub onto the pork pieces. Marinade in fridge for 20 minutes, then slide onto skewers. Place in a preheated oven (180) for 20 minutes or until golden brown. Place dry noodles in a bowl and pour over boiling water, close with a lid. 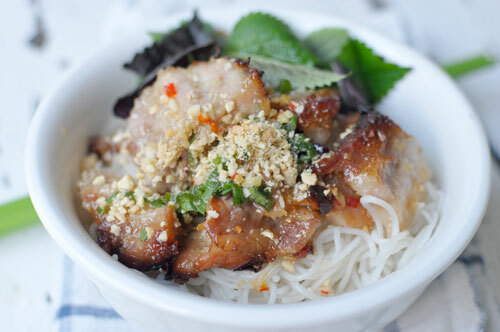 The vermicelli should cook itself within 10-15 minutes. Check regularly. Once it is cooked, drain with cold water. Prepare the dressing by adding and mixing all the ingredients together. Prepare the fresh garnish ingredients which serves as the salad to this dish. Traditionally, the garnish is placed underneath the noodles and the meat goes on top with the pickled carrots. Serve as a cold noodle dish with hot meat, sprinkle with peanuts. The dressing should be in a small separate bowl for each person to pour on and then mixed together.